Fifth Edition Fantasy is here! This adventure module is fully compatible with the fifth edition of the world's first fantasy RPG, and ready to play in your home campaign! 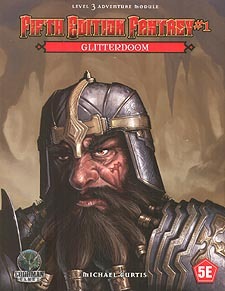 Centuries ago, the glitterdoom come to the dwarves of Steelhand Clan! This divine curse transformed the dwarves into hellish forms with and insatiable greed for gold. Now, a chance encounter breaks open long-sealed gates to unleash the glitterdoom again. Can your adventurers delve into the forgotten halls to confront the subterranean menace?